EvoRoom is an immersive, room-sized simulation of a rainforest ecosystem modelled after Borneo in Southeast Asia. Designed as part of the evolution and biodiversity unit of a Grade 11 Biology course, it situates co-located students in a simulated rainforest and engages them in a collective inquiry activity. 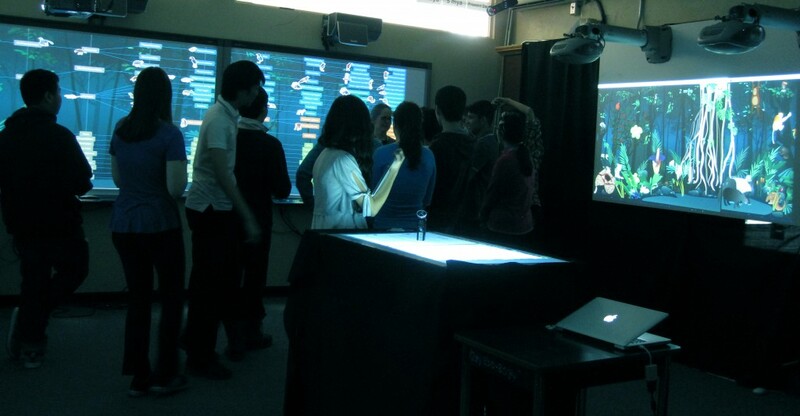 Implemented within a “smart classroom” research environment, the room is equipped with computers, servers, projection displays, and customized software to coordinate the flow of participants and content materials, as well as to collect data during the activity. During the collective inquiry activities, students take on the role of “field researchers,” working in various group configurations to complete tasks delivered to them on their personal tablet computers. The tablets help to place students in small groups, scaffold their activities, collect observations, and give real-time updates and resources. Student observations and reflections are aggregated and displayed on the interactive whiteboards in real-time. Running for approximately 12-weeks, the integrated curriculum includes in-class activities, homework, a field trip to the zoo, as well as two collective inquiry activities with immersive simulations. One of the collective inquiry activities focuses on the topic of evolution. Students work individually, in small groups, and as a whole-class to gather evidence of evolution by observing changes in life forms within the simulation as it is advanced (by the teacher) across two hundred million years. The second collective inquiry activity focuses on the topic of biodiversity. Prior to the activity, students are to make predictions about how certain environmental factors or changes (e.g., tsunami, earthquake, low rainfall) that occurred within a single season could change the biodiversity over a five-year time span. In the immersive environment, students are presented with four different versions (“scenarios”) of the rainforest ecosystem, challenging them to explore the differences between these four rainforests and to locate the scenario that resulted from the variable or factor they explored in their earlier predictions. To date, a pilot study and two design iterations of EvoRoom have been developed and tested as part of my dissertation research. The core design team consisted of two researchers (myself included) and a high school biology teacher. Meeting approximately once per week during the academic school year over two and a half years, we considered design elements and outlined our overall strategy. In the months leading up to the enactments, design meetings widened to include two technology developers, and in the second design iteration, three additional researchers. Lui, M., Kuhn, A., Acosta, A., Quintana, C., Slotta, J. D. (in press). Supporting learners in collecting and exploring data from immersive simulations in collective inquiry. Proceedings of ACM SIGCHI Conference on Human Factors in Computing Systems (CHI 2014), ACM Press. Lui, M., & Slotta, J. D. (2013). Exploring evolutionary concepts with immersive simulations. Proceedings of the 10th International Conference of the Learning Sciences (CSCL) – Volume 1, (pp. 304-311). International Society of the Learning Sciences (ISLS). Smørdal, O., Slotta, J. D., Moher, T., Lui, M., & Jornet, A. (2012). Hybrid spaces for science learning: New demands and opportunities for research. (Vol. 2, pp. 9–16). Proceedings of the 10th International Conference of the Learning Sciences (ICLS) – Volume 2, (pp. 9-16). International Society of the Learning Sciences (ISLS). Quintana, C. (2012). Pervasive science: Using mobile devices and the cloud to support science education. interactions 19, 76–80.